Click the titles to view results in each section. 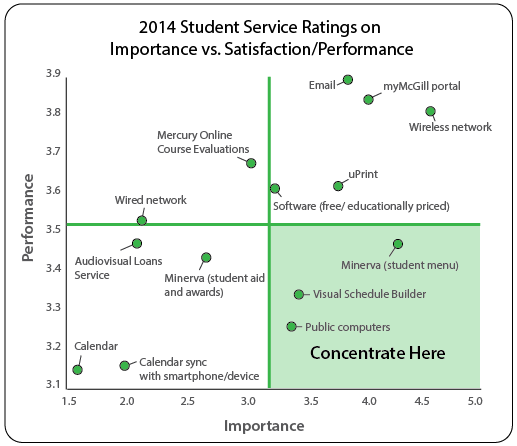 Students rated Email, myMcGill, Wireless uPrint and Software high in importance (avg. > 3), and gave them average ratings above 3.5 in performance as well. Minerva Student Menu, Visual Schedule Builder and Public Computers were deemed important, but were rated lower in performance. Some of the reasons were described in text-based responses. Students said they liked myCourses because it provides a single online access point for all their course content and assignments. uPrint was cited as useful in 27% of undergrad comments, though a few mentioned issues installing special print drivers. Free software is very important and appreciated by students (mentioned in 12% of grad and 5% undergrad comments). Wireless service is extremely important to students; sometimes connections are dropped; want seamless connection when moving through campus. Students said they typically brought smartphones (80%) and laptops (70%) to school daily; tablets were less popular. 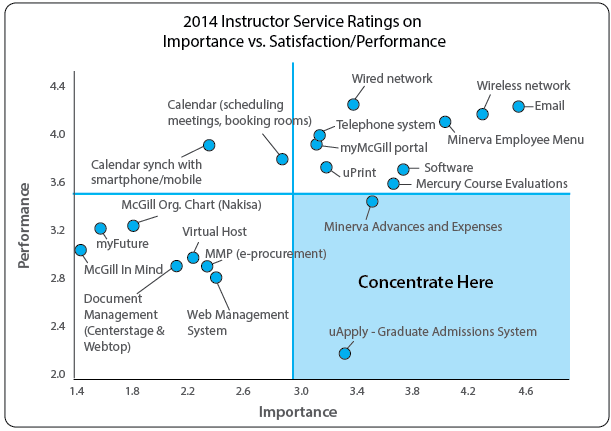 For instructors, most of the services they find more important are rated highly in terms of performance (averages of 3.5 to 4.2). Instructors asked for more storage space for email and file sharing. Over 70% of instructors are using cloud-based solutions such as Dropbox, GoogleDocs for file storage and sharing. Over 60% felt somewhat comfortable or very comfortable using the AV equipment in their classrooms. 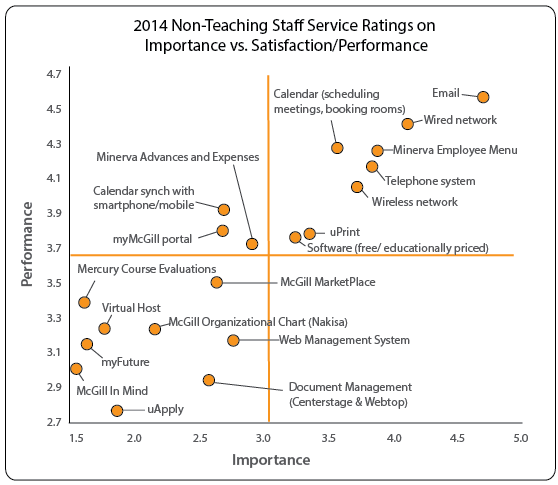 IT Support was mentioned specifically in 16 comments about services that work well, and satisfaction ratings were > 4.4 for both IT Service Desk (telephone support) and on-site Desktop & Network support. 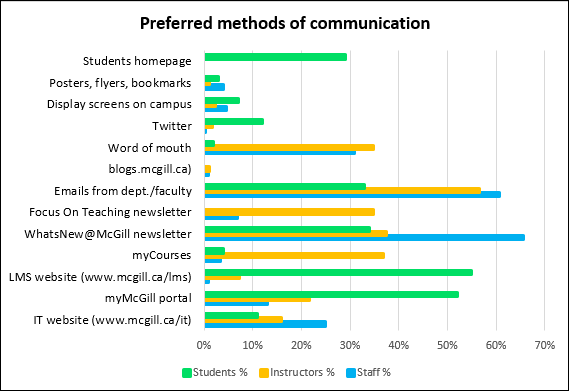 Email was the most effective method of receiving communications for both instructors and non-teaching staff. Students typically see announcements on websites they frequent. Office 365 ProPlus and Mathematica software are now FREE for students, faculty and staff. In December 2014, we introduced Microsoft OneDrive for students, with 1 TB of cloud storage for personal files. Faculty & staff access to OneDrive is coming soon. Office 365 Email in the cloud, with 50 GB storage, is coming later in 2015. Find out more about Office 365 at McGill. Over the past year, most of the computers in Libraries and other public spaces were replaced with newer, faster computers. We've started a pilot project to expand WiFi coverage to more outside areas, and there's a major project to upgrade McGill's entire wired/wireless network over the next 3 years. WiFi in McGill residences is now open to all students, faculty & staff members. The McGill VPN was updated with a more secure solution. In September 2014, we launched a security awareness campaign, ensuring that all McGill users changed their McGill Passwords. We also increased the maximum password length, allowing up to 16 characters instead of 8.